Bury Knowle is one of Oxford's most beautiful parks. The historic Bury Knowle House and its parkland setting provides a picturesque backdrop for picnics and events. The Narnia-themed sculptures and play area add extra magic to this well-loved green space. The park is proud to fly its Green Flag Award. The Green Flag is the standard for parks and green spaces in England and Wales, awarded by Keep Britain Tidy. It is a means of recognising and rewarding the best green spaces in the country. 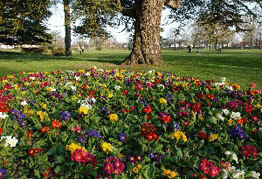 The park is located off London Road, Headington. By Bus: Oxford Bus Company, Stagecoach and Ariva stop at Headington, a short walk from the park. Buses to and from London and the airports also pick up and drop off in the same area. By cycle: Cycling in the park is not permitted but the park is accessible by bicycle from local roads. By car: There is limited free parking in the car park off Old High Street. Alternative parking can be found near Waitrose. Charges do apply. The park is open all day, every day. Oxford City Council purchased Bury Knowle House and its extensive grounds in 1930 from Henry Beaufoy, the owner of Henry Beaufoy & Co. Vinegar Manufacturers of Lambeth. The park was opened to the public on 2 April 1932 and is approximately 7 hectares. Some of the features and trees in the park such as the Ha Ha tree and the large Chestnut near the play area may date from the original landscaping. Bury Knowle Park is home to a number of sculptures including an artistic sculpture known as The Wheel of Hope and ‘The Story Book Tree’, which was based on stories by C.S.Lewis and J.R.R Tolkien, a book releases a horse, a lion and a dragon which sparks children’s interest and imagination. Bury Knowle House has been home to the local library since 1934. It is currently not possible to fly model aircraft or drones (both with and without camera for filming purposes) within Oxford City Council’s public open spaces, including parks and nature reserves. As these spaces are open to the public and experience high visitor numbers throughout the year, flying model aircraft and drones are not permitted for safety reasons. It is now easy to book tennis courts online before you come to the park. This is a great way to make sure one will be free for your game. You can book in minutes from your mobile, tablet or computer. If you forget to book before you arrive at the park the easiest option is to quickly use your mobile phone to reserve one of the available courts. If you do not have an internet-enabled phone you can also check availability and pay at the kiosk in the park. Oxford Tennis League - play friendly competitive matches. There are four 8-week rounds a year and adults of all standards are welcome to join. get exercise, improve your health and wellbeing. To find out more visit the Friends of Bury Knowle Park website. Friends groups are independent, but work in partnership with us.